Whilst speaking in an interview at E3, Daniel Suarez from Treyarch talked a lot about their next game, Call of Duty: Black Ops 2. One of the main things gamers always want to hear about though is the hugely popular zombie mode from Call of Duty: World at War. So what makes the new zombie mode different to the original? 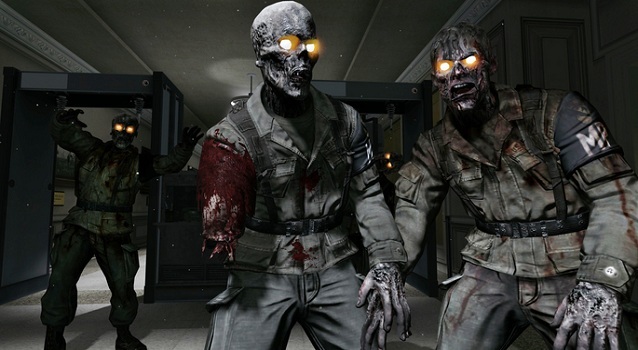 Well in the original it was designed as a part of the single player game, which you could play cooperatively with 3 other players, however in Black Ops 2 the zombie mode was designed from the ground up as another component of the multiplayer aspect of the game, and as such it will now also feature competitive game modes rather than just cooperative play. Suarez gave a good example of this, where he described a competitive zombie survival mode where two teams of four players play a standard match to see who can survive the longest. This of course opens up many possibilities, for instance if you can leave your building and interfere with the other team, it could be a risky decision with a possibly huge payoff. A zombie wager mode was also suggested, which could involve some interesting ideas. With the possibility of players in a standard zombie match being tasked with various objectives such as killing the most zombies in an allotted time. With the popularity of the zombie mode, you can garuntee that more details on the zombie mode will continually trickle out bit by bit.